A USB memory stick with information about Canada handed out at the Olympics to reporters by the Canadian government. The above picture, believe it or not, is actually a USB memory stick. 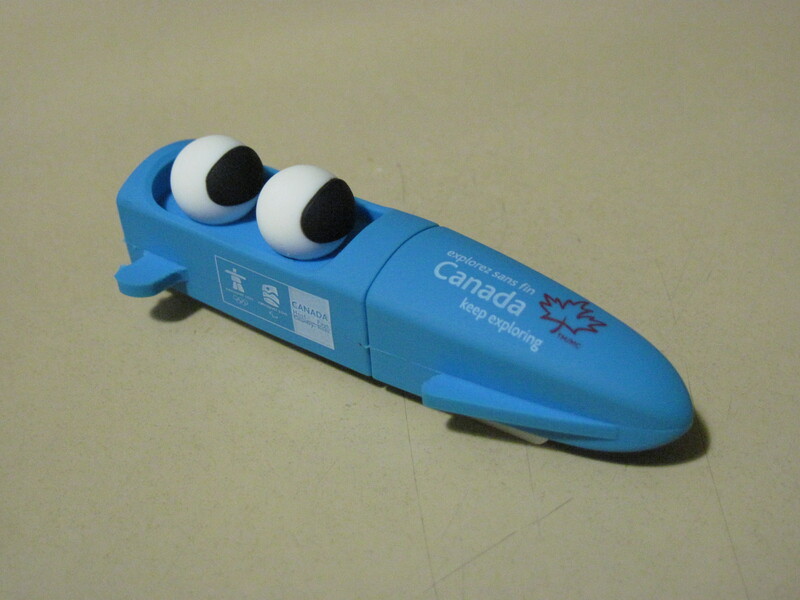 This cute piece of swag, fashioned out of rubber to look like a two-man bobsled, was commissioned by the Government of Canada and handed out like candy to reporters. I got mine at W2, one of the unofficial centres for unaccredited media types and bloggers taking in the games. They were just lying around waiting to be scooped up. But it has me thinking about the volume of Olympic-related crap we paid for. Walking around Vancouver, people had their passes and accreditations hanging from their necks and every one of those accreditations involved a lanyard and a plastic card. I’m guessing there were hundreds of thousands of them, if not millions. All of it landfill bound. A lot of it was also probably originally made and shipped over from China. Then there’s all the plastic water bottles, buttons, badges, not to mention packages for volunteers and Vanoc employees that contained pants, coats, shirts, Olympic mug and a bunch of other junk. This bobsled wasn’t the only USB stick I got either. I went to the B.C. housing Downtown Eastside information centre and they handed me a stick of information as well . At least that one was an Oracle stick and will probably keep working for awhile. Before the games were opening, the David Suzuki Foundation gave Vanoc a “bronze medal” for its attempts to mitigate its carbon emissions and effect on climate change. A perusal of the scorecard put out by the foundation shows the production, transportation and junking of this stuff wasn’t taken into account, just like the effect of helicoptering snow to Cypress Mountain wasn’t taken into account (the scorecard was released as the helicoptering was going on) or for that matter what actually happened during the games themselves. It makes me wonder why David Suzuki would sacrifice his credibility to help Vanoc greenwash the Olympics. Previous Oh Canada! What a rush!